Thatchers Gold Somerset Cider is a popular Apple Cider available from Tesco Groceries in 500ml to buy online. Visit Tesco Groceries for the best price for 500ml of Thatchers Gold Somerset Cider or compare prices on our other Apple Cider products. Crafted with care Thatchers Gold is full of flavour from English apples, many of which are harvested from our own family orchards in Somerset. Made using traditional techniques and expertise gained since 1904, this crafted medium dry cider has a smooth and refreshing taste. Where to buy Thatchers Gold Somerset Cider ? Thatchers Gold Somerset Cider Supermarkets & Stockists. 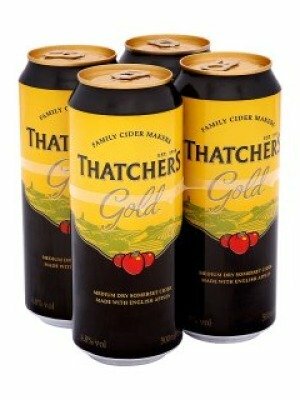 You can buy Thatchers Gold Somerset Cider online in most retailers and find it in the Apple Cider aisle in supermarkets but we found the best deals online for Thatchers Gold Somerset Cider in Tesco Groceries, DrinkSupermarket.com, Amazon.co.uk, and others. Compare the current price of Thatchers Gold Somerset Cider in 500ml size in the table of offers below. Simply click on the button to order Thatchers Gold Somerset Cider online now.